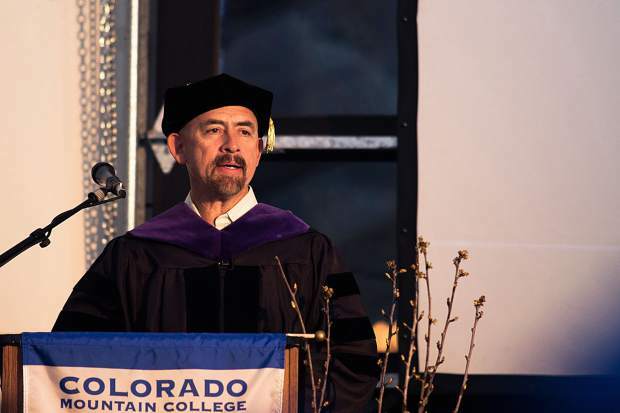 Commencement speaker Joe Garcia â former Colorado lieutenant governor past executive director of the Colorado Department of Higher Education, current president of the Western Interstate Commission for Higher Education â addressed graduates during commencement exercises for Colorado Mountain College Vail Valley Friday. During the ceremony Garcia received from CMC an honorary Bachelor of Arts in interdisciplinary studies, elementary education, as well as an honorary certificate in ski and snowboard business, in recognition of his exemplary leadership and contributions to education in the state of Colorado. Photo by Heather M. Hutchinson.